It seemed like it took forever for us to get here. If you’re as ready for the weekend as I am then you have one foot out the door, revving to go! Looking to give your taste buds some special treatment this weekend? Check out New York City’s premier gluten-free foodie event, The Gluten-Free EatUp, in Brooklyn on Sunday, July 13th from 1pm – 6pm. I love this event for many reasons. First, it’s free to attend so you can come and go as you please with no pressure to get your money’s worth. Next, the vendors are local and make high-quality gluten-free food that rivals its gluten-filled twin. I’ve had almost all the food from the different vendors and I can contents it’s so good you’ll keep coming back for more. 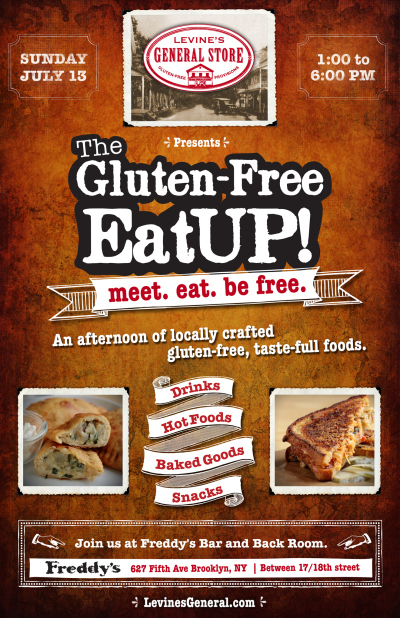 And of course, there will be tons of gluten-free foodies to meet and chat with. At the event you can treat yourself to a wide-range of gluten-free foods all in one place! Delicious comfort foods like mac n’ cheese, grilled cheese, empanadas, breads, pasta, as well as mouthwatering desserts, snacks and much more. It’s heaven on earth for us gluten-free foodies! Hey! Enter your email address to follow this blog and receive notifications of yummy gluten-free restaurant reviews and upcoming events in NYC by email.